Christian Dior Poison is the legendary flavor of endless temptation. Christian Dior Poison Eau de Toilette 100 ml. is an overwhelming and mysterious scent that acts as a perfect female weapon. Her exceptional exotic alchemy creates a disturbing, charismatic and unforgettable impression. The smell is hidden in a dark purple vial, which looks like a pot of poison, which derives the name of the scent itself. Christian Dior Poison toothpaste will open your door to your secret with its highly aromatic coriander, surprisingly reminiscent of the oriental scent of Brazilian pink wood, fresh anise, plum and forest fruits. Flower hearts contain a soft rose, rare tuberose, exotic ylang-ylang, intoxicating jasmine and other intoxicating essences. The mysterious temptation closes the warm tones of cedar and sandalwood, vetiver, unique heliotrope and sweet vanilla. Christian Dior Sensual Christian Toilet Water is specially designed for seduction. 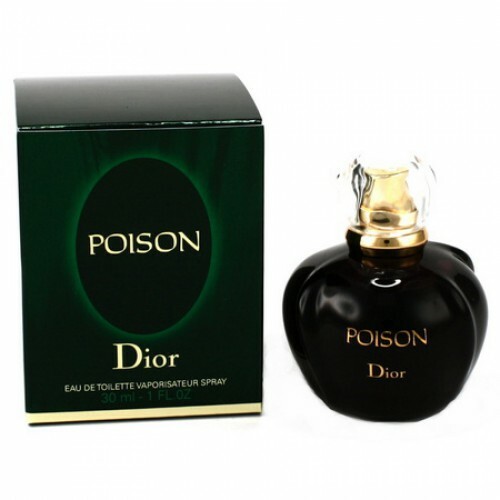 The Poison fragrance from Christian Dior's works is mysterious and incredibly enigmatic. With her help you will feel incredibly feminine and will bring unexpected attention around you. The fragrance was launched in 1985. He is like a mysterious stranger - always a step away from you and at the same time hiding somewhere far away. Like a secret admirer, he is interested and fascinated, while trying to stay at a distance. He is the floral-spicy fragrance of Poison toilet water from Christian Dior. Strong and feminine, persistent and incredibly sensual perfume is guaranteed not to leave you indifferent. The beginning of this intoxicating song of smells is written by a rugged combination of raspberry and coriander extract, Jamaican pepper and forest berries. The entry smoothly passes into the main part, giving a ringing echo of sweet honey and tuberose, mixed with cinnamon and orange color. The composition reaches its apogee at the very end, leaving an unforgettable plume of amber, a spectacular vanilla trio, cedar wood and persistent musk.